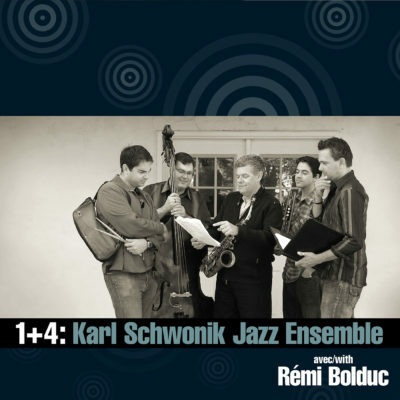 1+4 is Karl Schwonik’s dream project, as it bring together two of his favourite musicians: saxophonist Rémi Bolduc and trumpeter James Davis. The project name 1+4 is a play on words, as Rémi has his own project named 4+1. In this case, Rémi is the 1, the teacher; and the band is the 4, the pupils. Rémi is an unbelievable source of energy, talent and knowledge, and Karl is truly honored to have him join the band on this recording. The 1+4 project started in the summer of 2010 when the band completed an 8-city tour of Alberta and taught at the week-long Wetaskiwin Jazz Camp. On the tour, the 1+4 group visited cities with large francophone populations in an effort to bring the cross-cultural, bilingual project to the French-speaking community of the province. This album was recorded live at the Nancy Appleby Theatre in Athabasca, Alberta.